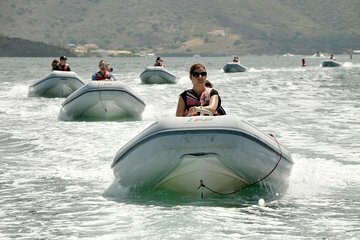 Get the chance to drive your own boat down the coast of St. Maarten on this 3-hour tour. With your guide in the lead, cruise along, watching the island scenery pass by. Make a stop for snorkeling at Creole Rock. Each boat can accommodate two passengers. Use of snorkeling equipment included; no experience necessary. At your chosen departure time (10am or 2pm), make your way to the Hertz Car Rental Dock in Simpson Bay, located next to the airport. Meet your guide and fellow adventure-seekers, then listen to a short introduction on how to operate the boat. Once you're comfortable, head out into the lagoon, then cruise down the scenic coastline, lined with palm trees and white sand beaches. Since you're in charge of your own speed, you can choose a relaxing jaunt or an exciting sprint. Stop and jump in, using the provided snorkel equipment to view the local marine flora and fauna around the famous Creole Rock. Snorkelers can expect to see flounder, parrot fish, tang, sergeant majors, and ballyhoo. On the way back through the lagoon, you'll get to see some of the marina's mega-yachts up close. Your tour ends back at your departure point after three hours.